This entry was posted on July 7, 2015 at 12:46 am and is filed under Comedy, Drama with tags 2015. You can follow any responses to this entry through the RSS 2.0 feed. You can leave a response, or trackback from your own site. Too inconsequential to recommend, but it didn’t offend me. Agreed. Mark Ruffalo is one of my favorite actors. Loved him in both Foxcatcher and Begin Again last year. 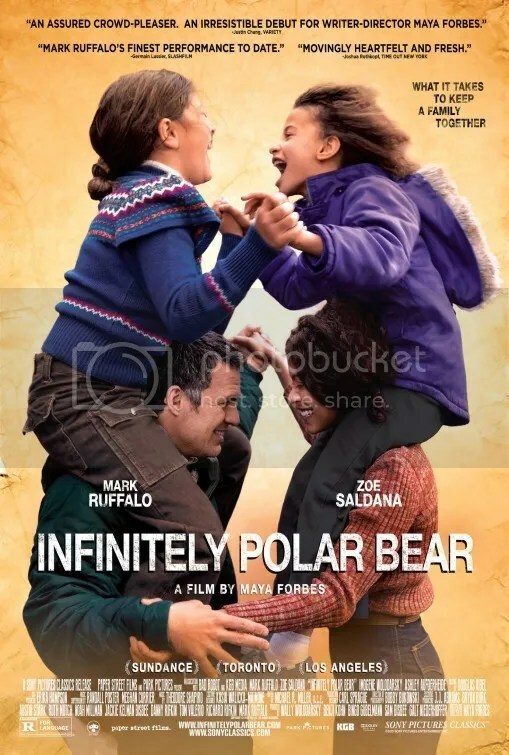 I guess I felt like it was more a story of the daughters than Ruffalo, but loved his work anyway. To each their own! As young Amelia, this is Imogene Wolodarsky’s first film. She was good so it’ll be interesting to see if she pursues an acting career. Infinitely Polar Bear is one I haven’t had a chance to watch, although I’m bummed to hear you found it shallow since I’ve heard good things from my friends. I’m not surprised that it’s presented as a series of highs and lows since Ruffalo’s character is bipolar, but I can understand your frustration that there’s little insight into any of it. I don’t think that mental illness often makes a lot of sense though, and I’m not sure there can be much explanation for the wild swings in his behavior. Your comments on how the people’s lives seem like quirky gimmicks and that the movie comes across like a sitcom are a little disheartening, because the film seems like it sets out to tell a more complex story than that. I’ll be curious to see if I feel the same way when I sit down to watch the movie. Yeah it’s not complex. It’s a superficial, albeit lighthearted, look into a bipolar man’s life.